Figure 1. A simple pendulum has a small-diameter bob and a string that has a very small mass but is strong enough not to stretch appreciably. The linear displacement from equilibrium is s, the length of the arc. Also shown are the forces on the bob, which result in a net force of −mg sinθ toward the equilibrium position—that is, a restoring force. Pendulums are in common usage. Some have crucial uses, such as in clocks; some are for fun, such as a child’s swing; and some are just there, such as the sinker on a fishing line. For small displacements, a pendulum is a simple harmonic oscillator. A simple pendulum is defined to have an object that has a small mass, also known as the pendulum bob, which is suspended from a light wire or string, such as shown in Figure 1. Exploring the simple pendulum a bit further, we can discover the conditions under which it performs simple harmonic motion, and we can derive an interesting expression for its period. where the force constant is given by and the displacement is given by For angles less than about the restoring force is directly proportional to the displacement, and the simple pendulum is a simple harmonic oscillator. for the period of a simple pendulum. This result is interesting because of its simplicity. The only things that affect the period of a simple pendulum are its length and the acceleration due to gravity. The period is completely independent of other factors, such as mass. As with simple harmonic oscillators, the period for a pendulum is nearly independent of amplitude, especially if is less than about Even simple pendulum clocks can be finely adjusted and accurate. Note the dependence of on If the length of a pendulum is precisely known, it can actually be used to measure the acceleration due to gravity. Consider the following example. Knowing can be important in geological exploration; for example, a map of over large geographical regions aids the study of plate tectonics and helps in the search for oil fields and large mineral deposits. 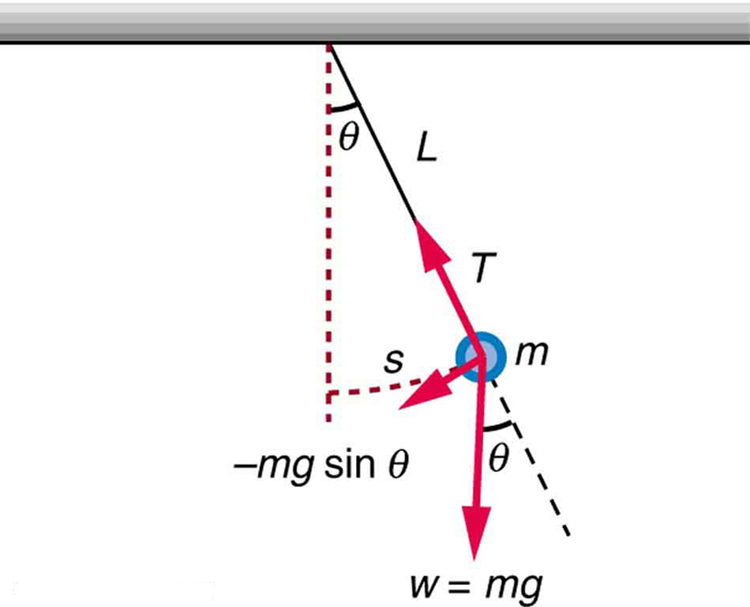 Use a simple pendulum to determine the acceleration due to gravity in your own locale. Cut a piece of a string or dental floss so that it is about 1 m long. Attach a small object of high density to the end of the string (for example, a metal nut or a car key). Starting at an angle of less than allow the pendulum to swing and measure the pendulum’s period for 10 oscillations using a stopwatch. Calculate How accurate is this measurement? How might it be improved? Play with one or two pendulums and discover how the period of a simple pendulum depends on the length of the string, the mass of the pendulum bob, and the amplitude of the swing. It’s easy to measure the period using the photogate timer. You can vary friction and the strength of gravity. Use the pendulum to find the value of on planet X. Notice the anharmonic behavior at large amplitude. where is the length of the string and is the acceleration due to gravity. 1: Pendulum clocks are made to run at the correct rate by adjusting the pendulum’s length. Suppose you move from one city to another where the acceleration due to gravity is slightly greater, taking your pendulum clock with you, will you have to lengthen or shorten the pendulum to keep the correct time, other factors remaining constant? Explain your answer. As usual, the acceleration due to gravity in these problems is taken to be unless otherwise specified. 1: What is the length of a pendulum that has a period of 0.500 s? 2: Some people think a pendulum with a period of 1.00 s can be driven with “mental energy” or psycho kinetically, because its period is the same as an average heartbeat. True or not, what is the length of such a pendulum? 3: What is the period of a 1.00-m-long pendulum? 4: How long does it take a child on a swing to complete one swing if her center of gravity is 4.00 m below the pivot? 5: The pendulum on a cuckoo clock is 5.00 cm long. What is its frequency? 6: Two parakeets sit on a swing with their combined center of mass 10.0 cm below the pivot. At what frequency do they swing? 7: (a) A pendulum that has a period of 3.00000 s and that is located where the acceleration due to gravity is is moved to a location where it the acceleration due to gravity is What is its new period? (b) Explain why so many digits are needed in the value for the period, based on the relation between the period and the acceleration due to gravity. 8: A pendulum with a period of 2.00000 s in one location is moved to a new location where the period is now 1.99796 s. What is the acceleration due to gravity at its new location? 9: (a) What is the effect on the period of a pendulum if you double its length? (b) What is the effect on the period of a pendulum if you decrease its length by 5.00%? 11: At what rate will a pendulum clock run on the Moon, where the acceleration due to gravity is if it keeps time accurately on Earth? That is, find the time (in hours) it takes the clock’s hour hand to make one revolution on the Moon. 12: Suppose the length of a clock’s pendulum is changed by 1.000%, exactly at noon one day. What time will it read 24.00 hours later, assuming it the pendulum has kept perfect time before the change? Note that there are two answers, and perform the calculation to four-digit precision. 13: If a pendulum-driven clock gains 5.00 s/day, what fractional change in pendulum length must be made for it to keep perfect time? 1: The movement of the pendula will not differ at all because the mass of the bob has no effect on the motion of a simple pendulum. The pendula are only affected by the period (which is related to the pendulum’s length) and by the acceleration due to gravity. (b) Since the period is related to the square root of the acceleration of gravity, when the acceleration changes by 1% the period changes by so it is necessary to have at least 4 digits after the decimal to see the changes. length must increase by 0.0116%. 16.4 The Simple Pendulum by OpenStax is licensed under a Creative Commons Attribution 4.0 International License, except where otherwise noted.